My Take: Perjury, Delusion or Dementia? “It’s a Lie” – In the Hatfield trial, Morrisseau family members in a group, submitted a sworn Affidavit which called Donald Robinson’s allegations a “LIE.” That they had all seen Norval sign and title his painting exactly like that many times. 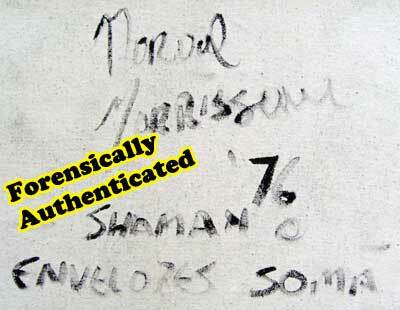 Numerous people, most of whom had never previously met each other, or had any association with each other, all separately submitted Affidavits saying that they had – contrary to what Robinson was claiming – seen Norval sign and title the backs of paintings in black paint, many times going back decades to the early 1970s. Others saw him do it in the 1980s; still others in the 1990s. In Ottawa; in Thunder Bay; in Vancouver. Wolf Morrisseau, Norval’s younger brother, and for years his business manager, swore he saw Norval do it some 2,000 times or more in the 1970s. In fact he said he was the one who started him doing it, to increase sales in foreign countries where English writing is preferable to Cree Indian syllabics and a lot more universally understandable. 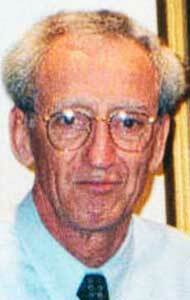 Donald Robinson had an answer for all the sworn affidavits, when questioned by Defence Counsel Robert Dowhan. “Q. All right, and you tendered as Exhibit 10 to this proceeding a document that you brought yourself that there are one, two, three, four, five, six individuals that say they witnessed Norval Morrisseau sign paintings on the back in black acrylic paint with a brush. A. They are all lying, absolutely. They’re complicit in this whole scheme. Most Damning of All – the “DNA” Speaks for the BDPs – There are now some 70 forensic findings, by three of Canada’s top handwriting analysis experts who have analyzed the signatures on the back of the very BDPs that Robinson says were all forged. Without a single dissenting finding, they have unanimously found, with DNA certainty, in every case tested, that the signatures were made by Norval Morrisseau, and could not have been made by anyone else. But Robinson refuses to recognize any of it charging that the professional forensics experts who have testified in hundreds of court cases – like Dr. Atul K Singla – are liars too. In fact the very black paint DNA that Robinson claims is fraudulent saved scores of these genuine Morrisseau paintings from being reduced to rubbish by the Robinson family and their compliant outreach workers at the KRG branch plant operation: the Norval Morrisseau Heritage Society. Norval wins this one, speaking from the grave, with the handwriting DNA he left on the back of thousands of his paintings from his high period of the 1970s and early 1980s. But which were a marketing irritant under the skin of the Robinson family and their attempts to sell the wobbly stuff from Norval’s 1990s “Wheelchair Invalid Period” of painting. 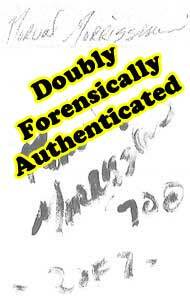 The forensics experts have the final say about forgers and forged signatures. 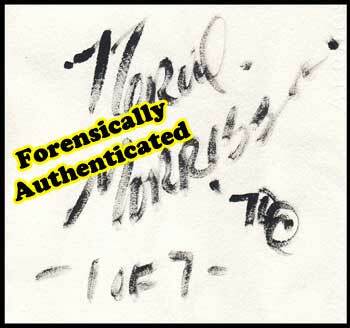 The typical BDP signature on the back of almost all of Randy Potter’s Morrisseaus, that Donald Robinson and other Morrisseau collectors saw. The Conspiracy Theorists, at first in love with the signatures, would suddenly change their minds, say the huge signatures on every canvas were all forged, never explaining why such a huge betraying forgery would possibly be put there by even the dumbest forger, knowing it would betray him instantly. In fact the Stupid Forger was turned in by the signature DNA in the end thanks to handwriting analyis by top Canadian forensic scientiests. 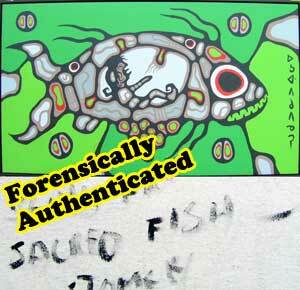 The Dumb Forger turned out to be, with DNA certainty, none other than Norval Morrisseau himself. – a forger’s very first concern, above all else, is to avoid getting caught. – a forger’s second concern is to copy an artist as closely as humanly possible, to avoid getting caught. – a forger would never write a signature on the back, if the artist never did it, which is what Donald Robinson claims is true. – a forger would never write in black drybrush on the back, if the artist never did it, which is what Donald Robinson claims is true. – a forger would always write less, not more. If an artist doesn’t write anything, why would a forger sign a name? If an artist writes only a name, why would a forger add a long title? Or add symbols? Or dates? Each additional bit of writing is another departure from the norm of what the artist would do and so would inevitably trip up a forger, when a handwriting expert gets at it. Why would any forger want to lay all these traps for himself? 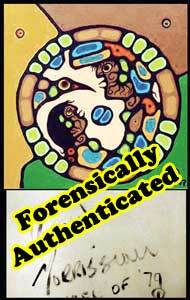 – a forger would conform with a passion, and never vary from a known Morrisseau signature. Then why are the signatures wildly all over the place, differing in size, in placement, in care, many harshly clear, and others too faint to make out? Absolutely not, rebutted Dr. Singla firmly. Only an artist would dare depart from a normal signature, to vary the size, attack of the letters, because – hell – he’s expressing himself, on a good day or a bad day. A forger would never do that. He conforms, because he knows if he does not, he will get caught. Dr. Singla said all this points to one thing: the Morrisseau BDP signatures, on the back of the paintings, are absolutely not the work of a forger. And he has an MA and a Ph.D. in forensics to back him up, and the experience of testifying in over 500 court cases dealing with forged signatures. Finally the BDP DNA of signatures, that have been wildly all over the place have been independently evaluated by three of Canada’s top forensic document examiners and handwriting analysis experts, over the years. The men do not know each other. Yet in some 70 findings they have unanimously found, with DNA certainty, that these hugely varying, wildly all over the wall signatures are authentic signatures of only one man, the irrepressible Norval Morrisseau, without a single dissenting finding. And that Donald Robinson is just as wrong as wrong can be for whatever reason. This entry was posted in Art Galleries, BDPs - Black Drybrush Signed Painting, Forensic Expert Findings, Perjury or Dementia. Bookmark the permalink.